CHICAGO, November 14, 2018 – Genuine Scooters today announced their entrance into the motorcycle arena in grand style with the release of their G400C motorcycle. The Genuine G400C features a 397cc fuel injected engine and 5-speed transmission on a classically retro designed body. Weighing in at 353 pounds, it boasts 26 horse power to reach a top speed of 80 mph and fuel efficiency of 70 mpg, giving you approximately 240 miles of cruising range thanks to its 3.4 gallon capacity. The 19” front and 18” rear wheels, and a 31” seat height, makes the G400C perfect for the first time motorcycle buyer. Available in black, green or red, the Genuine G400C also offers numerous accessorization options and comes with an industry leading 2-year/24,000 mile Genuine Confidence Warranty and Roadside Assistance Program, supported by a network of 240 Genuine Authorized Dealers across the country. Three years in coming, I’m ‘excited’ to see one in person and ride it. Many of us however had given up on it. So, does the G400c get its own Forum on MB - or is it too different from the scooters? One thing I really like about this new bike; It has a MOTORCYCLE seat! Not a bicycle seat. It won't have to be replaced for rides over 30 minutes. My only peave about modern motorcycles is the thin little triangular bicycles seats they come with now. The idea is to remove all thigh support so shorter riders can flat foot. I get it but why not just lower the seat? With all your body weight on your tailbone the first thing you do is turn around, go back home & start pricing aftermarket seats online. As I did with my current motorcycle. Companies know their seats will pass a 10 minute test ride & that riders over 5'3" will be paying to replace them. I go to an annual motorcycle show & sit on dozens of new bikes & ALL of them have useless seats except big touring bikes or cruisers. Anyway, had to vent about that & applaud Genuine for bucking the trend away from comfort. Include the cost of a new seat for anything else in its class. Now the G400c HAS its own Forum. Hurray! Does anyone have a G400C yet in the wild? I've been looking at pics of this bike for 3 years & hope to see one in my local showroom soon. This is what most motorcycles looked like in the 60s & 70s when I grew up & first caught the urge to ride. Skinny 18/19" wheels, not chunky 17". Straight line from the rear fender to the forks. No plastic panels hanging down at weird angles like melted wax. No plastic elephant ears/fake air scoops on the gas tank. No 3 foot long plastic tail for the license plate. The front end doesn't look like the face of a science fiction creature. A REAL seat, not a slanted downward Tour de France bicycle seat with the pillion sticking up in the air like the stinger of a mashed hornet. This bike is tempting. After 12 years I'm still happy with my motorcycle but 490 pounds is getting harder to fight at my age. In & out of the garage & around the cars. That's why my scoots get more miles lately. There is one in our local Tucson showroom, but I don't know that they've sold one yet. I joined up here to learn more about the G400C. My first motorcycle was a Honda SL70, so in my mind, the Genuine bike is what a motorcycle is supposed to look like. Same for my husband Doug, who rode an XL350 everywhere back in the day. Anybody actually sat on one of these or had a test ride yet?? Thanks, Howard. Nice to know they actually exist! None of the dealer websites show one in stock anywhere near here. I tried a Cycle Trader search and can't find one within 200 miles. Howard, have you had a chance to take a good look yet? Weekend's coming up, hopefully somebody will have a chance to visit the showroom. Our local dealer in Portland, OR has one. I will see it next week. Looks like they've added a feature to the dealer locator on the Genuine site, there's a checkbox now that shows g400 locations exclusively. Looks like they are spreading out fast! Very handy, thanks for the tip! Showing up in Cincinnati, looks like. Okay, I was in the shop this week to get my wife's scooter serviced. Took a look at the new G400c on the floor. It was a green one, and I have to say that the fit and finish were very nice. I did not take it for a spin, but I did sit on it and start it up. Started and ran smoothly. Sounded great. Ergonomics were ideal for me (5'9", 29" inseam). I could flat foot it easily, which is saying something as I can not quite flat foot my Vespa GTS. The riding position and reach to the handlebars were right for me. The retro look is great. The nice paint job on the tank, the mufflers, and the wire wheels all make you think of a junior Triumph. I liked the bike a lot. I'd suggest anyone who has the slightest interest, go take a look. Boy, that sounds nice. I messaged Genuine a few weeks ago, they are working on a 440 big bore kit, exhaust options, and tires from Continental. Hi Sarah, thanks for that information! That 440 number sounds like a straightforward 10% increase in displacement, but 440 is also a magical number from the history of single cylinder motorcycles. If anybody is interested, you can read a bit about the BSA 440 motorcycles here on Wikipedia. Here's a pic from that Wikipedia entry. He says this pipe is way too loud, hopefully Genuine will offer better. He also tries to clear up some of the information regarding the history of Shineray. I love what they did to the 400C. It's exactly what I envision when I think scrambler. Too bad Genuine isn't offering the bike set up like this because then I would seriously think about buying one. As it is now, not a chance. It's not like Shinray doesn't make a scrambler version of the bike as can be seen in this video of the Mash Dirtstar Scrambler 400. So Genuine missed the boat as far as I'm concerned. That is a nice conversion! I can see why you like it. So what does Cleveland Moto say about the cost of ordering one of their Genuine 400C scrambler conversions? Their are not any local dealers that would be willing to do the same? I don't think Cleveland Moto has any interest in offering a conversion since the guy said they won't be making anymore of that exhaust system. It would be pretty expensive to have another dealer make a conversion that looks the same because of the custom exhaust and both wheels would have to be relaced with alloy rims. EDIT: Oops! I just noticed that those alloy looking rims are stock on a G400C. Shinray also makes a decent looking cafe racer that Genuine is missing the boat on too. I'm really liking the silver version. Oh well, doesn't matter because as soon as the weather gets a little better around here I'm going to my local Royal Enfield dealer to have a look at their Himalayan. 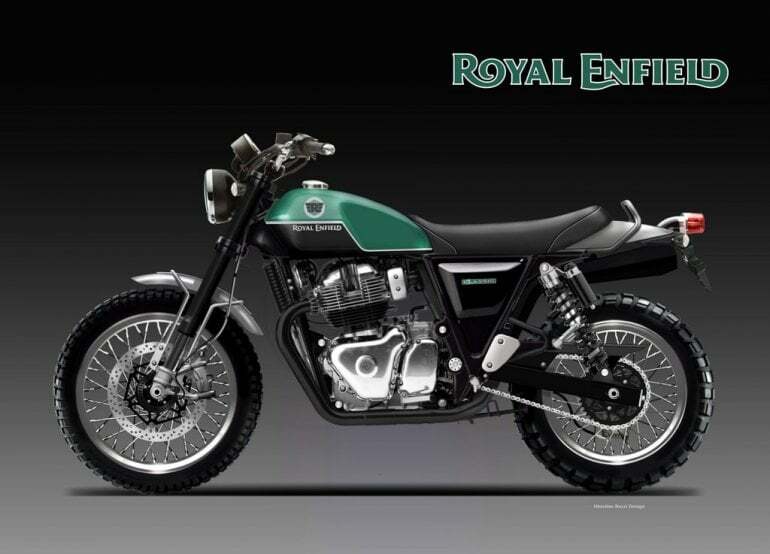 Oh well, doesn't matter because as soon as the weather gets a little better around here I'm going to my local Royal Enfield dealer to have a look at their [strikethrough]Himalayan[/strkethrough] Interceptor 650. Lol, nope, only if they offer an adventure bike version. Some of these Mash accessories should fit the G400C. I wonder if they'll ship to the US? They're offering a pretty cool sidecar setup too. I wish someone in the US would hurry up and post a ride report. What I was trying to do was indicate that there's a lot of talk about a scrambler version of this bike. In India, it's not quite legal to make the kind of mods we take for granted, such as exhaust, etc, so manufacturers have a strong incentive to build versions such as a scrambler. Here is one of the pix that are circulating the Indian moto blogs. Me, too. I am starting a thread to solicit First Ride Impressions. That rendering of a 650 scrambler looks fantastic! A true competitor to the Triumph scrambler in the "retro" look market. As it stands now, Triumph is the only one available in that displacement class of the market. If they release that at a reasonable price then I'd be very interested. I know, right? I thought that one pic would be worth 1K words. That's why I was so anxious to get it posted up. I just watched a YouTube video of a Himalayan review where the reviewer had bought her Himalayan in India and rode it all over Asia. The interesting thing is she mentioned that while in India she found out that RE is planning on releasing a 650 version of the Himalayan. Yay! I searched youtube for Genuine G400C to re-watch the videos and read the comments. Cleveland Moto says it's everything you like about a TU250 with twice as much oomph. That sure sounds nice. Sorry folks, didn't mean to hijack this thread. I'll take further discussions to the motorcycle thread. He also says it runs out to 90mph with no problem. That sounds even better, but I might be having a little trouble believing it. I find it hard to believe too because in a review of the Mash 400 (same motorcycle) he said while it will do 80 mph, it does it with the engine at 7000 rpm and lots of vibrations. Not very good for engine longevity or rider comfort. Many scooters and small motorcycles go 90 mph downhill. They all go 90 mph when you drop them over a guard rail. On the other hand, my Vespa (278 cc) tops 80 mph on the level, so who knows til you try it. New Rule: Unless Top Speed claims are backed with a timing slip, they are not to be posted. New Opportunity: Be the first person to run a Genuine G400C through the timing traps at Bonneville. One of our members already was the first to run a genuine Blackjack through the timing traps at Bonneville, but the G400C opens up a new opportunity. I'll create a special Member Classification for the person who does it. Anybody else had a look at the Genuine G400C? Someone has to take one of these to the drags, asap. If it'll top out in 1/4 mile, that is. Vespa Motorsport/Scooterwest has a new video reviewing the G400C! "New Rule: Unless Top Speed claims are backed with a timing slip, they are not to be posted." Top speed stories can be a lot like fishing stories. -I would be willing to accept a pic of a GPS speed readout. Top speed in the 1/4 mile is not the same as top speed. A Ninja 250 could never reach The Ton in a 1/4 mile. Thanks for that video johnk!